Although relatively young, the west coast holds many mysteries. Some of the oldest inns and hotels in Oregon have unexplained occurances. Venture here if you dare. Along the rustic coastline of Yachats, Oregon sits a legendary lighthouse and its adjacent keeper’s house. However, it’s not just any lighthouse - it is believed that the keeper’s house is haunted. The lighthouse has sat on the rocky point overlooking the Pacific for about 115 years, whereas the keeper’s house has been turned into a bed & breakfast not too long ago. Apparently, the keeper’s house included a ghost who has decided to stick around. 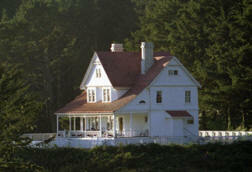 So who is the ghost haunting the Heceta Head Bed & Breakfast? It is believed her name is Rue who is described as a woman with silver hair and wears a long, dark dress. Legend has it that she is believed to have been both the wife of a past lightkeeper and the mother of a girl who fell off the cliffs and died. 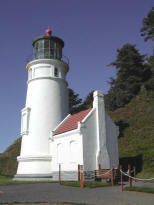 The child is reportedly buried on grounds of the lighthouse. It seems that Rue doesn't like her old home being with messed with. Maybe she is worried that she will lose her home as she did her child or worried her child’s grave may be endangered. Some episodes include the time when volunteer workers were painting. During the night, the fire alarm kept going off. One of the workers got up and made sure there was no fire and then went back to bed. However, the fire alarm went off again. Once again, the worker checked around and saw nothing - this time removed the battery from the alarm! Oddly, though the battery had been removed, the alarm again sounded! Creepy! Another mysterious occurrence happened when a workman cleaning the attic windows said he saw Rue up close and personal! He was so scared that he fled and wouldn’t go back to the attic. A few days later, he accidentally broke the attic window when he was working on the exterior of the building. He repaired the window from the outside and refusing to enter the attic to sweep up the glass. That night, workers reportedly heard scraping noises coming from the attic. When one of the workers went to the attic the next morning to investigate, he found that the glass had been swept into a neat pile beneath the repaired window! Apparently Rue will take care of business herself! Other occurrences include hearing unexplained screams, objects mysteriously moved from its location or gone missing, footsteps being heard from the attic. There have even been reports that some have witnessed an elderly woman looking down at them from an attic window or spotting a glimpse of a shadowy female shape. 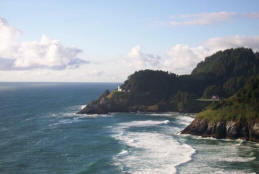 The Heceta Head’s haunting has been documented in Life Magazine as well as several books. Ghost Stories of Oregon by Susan Smitten explores the ghost of Rue in 5 ½ pages! As well, Rue was highlighted on "The History Channel." The historical Heathman Hotel, located in downtown Portland, first opened its doors in 1927 and like many other downtown hotels in big cities, it has been revitalized to its former glory. The lobby is now a gorgeous blend of Art Deco and Japanese style. But this is certainly not the draw for haunted hotel enthusiasts. 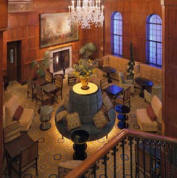 The Heathman is also home to a ghost with the penchant for rooms ending in “03”. There have been numerous reports that all the rooms at The Heathman Hotel ending in “03” have weird or mysterious occurrences when guests stay in them. Room 703 is particularly affected by this ghost. Once a guest leaves this room, they return to find clean towels used, glasses of water removed, chairs and desks moved or rearranged. Could this be a crazy maid messing with the guests? Perhaps not because hotel records show that no one used an electronic key during the guest’s departure and arrival back in the room. Creepy! But it isn’t just Room 703. All the rooms in the column 703, 803, 903, etc. report strange activity. Once a psychic staying in Room 803 reported she saw a ghost at the end of the bed. The psychic theorized that someone may have jumped to his or her death and now haunts all the rooms that were passed on the way down.